And here they go again, our commentators assess the debate: This posting represents nine separate commentaries from Len Lazarick, Todd Eberly, Barry Rascovar, Tom Schaller, Blair Lee, Rick Vatz, Brian Griffiths, Blaine Taylor, Melissa Bolling and Charlie Hayward. MarylandReporter.com had reached out to more folks for reaction, hoping for more gender, racial and political balance, but this is what we got by Sunday afternoon. We’d especially like to hear from those who thought Brown did well (and why), as opposed to how most of our commentators rated him. You can watch the full-hour video by clicking here. If we get more commentary before 7 a.m. Monday, we’ll post it to. Send them to Len@MarylandReporter.com. Or add your comments at the bottom of the story. Saturday’s debate was the best so far, a real debate that seemed to have profited from problems in the first two debates with format and setting. The third time was the charm as the candidates were in top form, the moderator was firm, flexible and impartial, and the questions were strong and probing, but unfortunately elicited some of the same oft-repeated responses. On the other hand, that avoids the kind of off-the-cuff improvisation that can get a candidate into trouble. On the bright side, an average voter without much information about the two candidates would walk away with a pretty good idea of where they stood on many issues. Hogan landed more telling blows, particularly on the question of corruption and cronyism in contracting, and Brown did not deflect them as sharply as he should have. Brown led with what should have been his most telling counter to Hogan’s relentless pounding on the loss of jobs and businesses by promising to give Maryland “the most competitive business climate in the nation,” a goal that represents a marked change in attitude, but also seems wildly unrealistic given how far the state has fallen in most business rankings. “Maryland leads the nation in reducing the education achievement gap by income” but not by race, said Brown, a pretty serious admission of one of the most persistent problems with public education in Maryland. On the health care, Brown has not much changed his position in months. That position essentially is: Despite the fact that we royally screwed up, I was only partially in charge; most Marylanders kept their insurance, we insured 400,000 more of the uninsured, and we’re working on a fix. Obvious question not asked before: Does race matter in this race? Brown notes he would be first African American governor (by way of Jamaica) and only the third in the nation. Biggest exaggeration: Too many to count. One of the nominees from Hogan is: “Every word in every commercial [ about him] is false…Every ad is completely false,” but “my commercials are great,” and positive. Funniest line: Brown’s promised: “I’m going to wake up every day with Ken Ulman,” to work together on the state’s problems. He repeated the promise in his closing remarks. “Every day Ken Ulman and I will get up with Marylanders.” New administration, new sleeping arrangements. Len Lazarick is the editor and publisher of MarylandReporter.com. Anthony Brown and Larry Hogan from a screenshot of the video. The lighting often produced this unusual bright spot next to Brown’s right eyebrow. 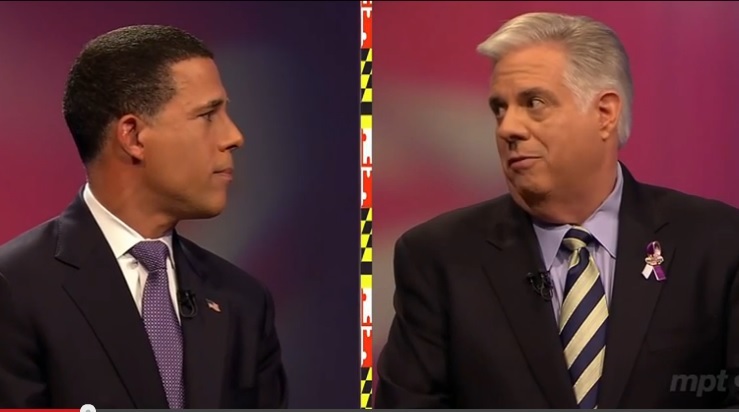 In their prior two debates I argued that Larry Hogan and Anthony Brown had fought to a draw. Both men had done well and neither could be declared a winner. Not. This. Time. Almost from the very start, it was clear that Larry Hogan was the more engaged and more engaging candidate on that stage. Whereas Hogan seemed relaxed and even jovial during many tense exchanges, Brown appeared to be irritated or uncomfortable, frequently stretching his neck as if his shirt collar was too tight. But you don’t lose a debate based upon appearances. Brown lost in his answers. In a serious question about Maryland’s many failing schools, Brown ignored the question and instead offered his prepackaged universal pre-K proposal. Never mind that universal pre-K will do nothing to save Maryland’s failing schools — in fact, taking $150 million a year in gaming revenue to fund pre-K limits what can be dedicated to failing schools. On the health care exchange, Brown never really answered the question concerning his true responsibility. Rather he talked around the question and discussed what was done after the exchange had failed. When he was pressed about whether he was in charge or in the meetings where problems were being discussed he again skirted a direct answer and then said that he had accepted responsibility… but he never made clear just what he had accepted responsibility for. I think Brown’s worst moment (of many) was his lengthy and testy exchange with Hogan over the matter of disagreeing with their respective bosses. Brown seemed determined to make the point that there was no difference between being a lieutenant governor under O’Malley and being an appointments secretary under Ehrlich. Brown’s best moment was his discussion of public/private partnerships and infrastructure projects. He had a ready list of projects throughout the state and gave a great answer. Though I think he may have lost some folks when he made the case that Marylanders are paying less for gas this year than they were last year. Maybe, but the price is not lower because of the tax increase. So I’m not sure what his point was. And without the tax hike Marylanders would be paying even less. Hogan had a great night. He was strong on his answers and he was especially strong with his rebuttals. Early on during the education discussion, Brown again said Hogan wanted to give millions to corporations instead of fund universal pre-K. Hogan shot back with a reference to a New York Times account of O’Malley/Brown giving hundreds of millions to corporations – which Hogan said he wouldn’t do. During the exchange over transportation funding, Hogan was relentless in pointing to the money taken from the transportation trust fund and argued that perhaps there would have been no need for a gas tax increase had the trust fund not been raided. Then Hogan pointed to the O’Malley/Brown focus on mass transit at the expense of roads and bridges and Brown never disagreed. Hogan’s worst moment came after Brown’s discussion of race and gender and health and income disparities in response to a question about him being the first African American governor. His answer was off topic, but it was a fine answer. Hogan’s sarcastic dismissal, “I have no idea what he just said,” was unnecessary and a bit nasty. Hogan had many good moments. When Brown accused Hogan of “rooting for failure” Hogan responded, “If I was rooting for failure I’d just let you be governor.” It was a devastating moment. His answer regarding the state’s heroin problem and his plans to declare a state of emergency was also strong. I think the most interesting exchange was over the question of negative ads. It provided Hogan an unfiltered opportunity to refute the content of the ads and he did. Then Brown decided to simply defend his ads and especially the issue of gun control. This allowed Hogan another opportunity to refute most of Brown’s accusations. And Hogan repeated over and over that people care about jobs and the economy. In response, Brown ignored jobs and the economy and tried to tell voters that they don’t care about jobs — they actually care about abortion and guns (the two issues that Hogan just finished promising he wouldn’t touch). It was ironic that Brown referenced Hogan’s recent statement that he would be a goalie in Annapolis. Brown criticized Hogan, saying a goalie plays defense. Maybe, but Hogan was on offense almost all night and in exchange after exchange, Brown had precious little defense to offer. On many issue, Brown made no real effort to counter what Hogan was saying — creating the impression that Brown was conceding those points to Hogan. So it was a great night for Hogan and a bad night for Brown — Hogan won by winning and Brown lost by losing. That said, this is Maryland and it remains Brown’s race to lose. He certainly took a step in that direction in this debate. Only time will tell how big that step was. The debate panel: Deborah Weiner, Steve Hammond and Jeff Bowers. It was the best gubernatorial debate but was anyone watching? Who stays home Saturday night and turns on the TV to listen to politicians hurling angry charges at one another? Both Democrat Anthony Brown and Republican Larry Hogan Jr. have memorized their script. Hogan: time for a change, cut taxes, cut spending. Brown: fighting for working families, keep the momentum going. Hogan never went beyond the superficial economic themes he harps on. Is there any meat on the bone? He won’t tell us. Brown displayed a bit of policy wonk-ishness but couldn’t resist repeating blatantly false allegations against Hogan. There were a few moments of clarity. On transportation, Hogan all but said he’d kill the Red Line and the Purple Line and dump transportation cash into roads. He played to his strength among rural voters watching Saturday’s debate. Brown repeated his education emphasis on career education for kids not going on the college. Hogan championed charter schools over more public school funding; Brown made a strong pitch for voluntary pre-kindergarten. Brown gave an in-depth response on how he’d close the achievement gap; Hogan mentioned the gap, then failed to answer the question. Both favored a balanced approach on environmental and agricultural issues. Hogan tried to win Eastern Shore votes by attacking phosphorus management regulation. Brown parted ways with Gov. Martin O’Malley on the fracking issue, calling it a “tremendous economic opportunity” he’d allow if it can be done without “disturbing the rural legacy” of Western Maryland. Hogan called fracking an “economic gold mine,” which dramatically overstates the case, and condemned O’Malley’s intentional foot-dragging. Brown, for the first time, said his No. 1 “strategic goal” would be uplifting Maryland’s business climate – another significant break with O’Malley. Hogan called the Brown-led health exchange roll-out every name in the book – “unmitigated disaster,” “the worst in the United States” and “the biggest boondoggle in state history.” All true, but we still aren’t sure how he’d approach health care for the under-insured and uninsured. Brown gave specifics on attacking the state’s heroin epidemic; Hogan merely said he’d call a summit to draw up a plan. Those who feel the glass is half-empty will say Hogan won the debate; those looking at the glass as half-full will say Brown did better. It’s in the eyes and ears of the beholder. Until Saturday night, Republican gubernatorial nominee Larry Hogan had deftly used the debates with Maryland Lt. Governor and Democratic nominee Anthony Brown to turn what might have been a blowout race into a much more competitive contest than Brown and the Democrats would prefer. In general, both candidates in the final debate stuck to earlier positions, talking points and biographical boasts. Other than Brown’s blunder in calling the city of Frederick “Frederickstown” (a gaffe the Hogan campaign post-debate used to paint Brown as disconnected from Western Maryland), and Brown’s clever dismissal of Hogan’s pledge to act, if elected, as a goalie vis-à-vis the Democratic legislature, there wasn’t much news broken in this debate or anything new learned about either candidate. But thanks to a more advantageous set of topics for Brown covered in this final debate—certainly more favorable than in the previous debate, one that focused almost exclusively on tax, spending and budget issues—coupled with a relatively strong Brown performance, Brown regained some of his lost footing. For example, in early questions about education and environment Brown was strong on the need to fund universal pre-kindergarten for all Maryland youngsters and protect the Chesapeake Bay. Midway into the debate, the focus shifted to more comfortable ground for Hogan: taxes, business investment and economic competitiveness. If Hogan were limited to just two words to describe Brown, they would be “business unfriendly,” and not surprisingly, Hogan again criticized Brown as an anti-business, tax-happy lapdog to the current governor, Martin O’Malley. And, of course, Hogan made sure to mention Maryland’s problematic rollout of the state’s Obamacare website—a political knife Hogan has been twisting in Brown’s back throughout the campaign. What’s so interesting—and perhaps depressing—about these debates and the larger set of campaign charges and counter-charges leveled by Brown and Hogan, is how much each candidate has tried to link his opponent to the two recent, respective governors from each party: Hogan saddling Brown with O’Malley, of course, but Brown also trying to associate Hogan with Bob Ehrlich. For all the gauzy talk by both men about the state’s future, so much of this rather uninspired campaign has been an argument between two candidates often obsessed with Maryland’s past and its two most recent chief executives. One wonders how well that bodes for the state’s future. Thomas Schaller is chair of the political science department at the University of Maryland Baltimore County. The final debate mostly reflected the same dynamics and themes as the previous two; Hogan wants the election to be a referendum on taxes/economy/jobs while Brown wants it to be a referendum on Hogan who, Brown says, is a conservative extremist. Hogan seemed less focused than during the prior debates and his closing was “off”…is he tired? Brown was more on the attack than before but some of his punches fell far below the belt. Objective fact-checkers (do any exist?) could easily refute Brown’s claims that Hogan, as Ehrlich’s patronage officer, helped cause higher ed tuition hikes. Likewise, Gov. Ehrlich “raised the state property tax”– but only because the Board of Public Works two Dems provided the deciding votes). Other Brown distortions include his claim that O’Malley didn’t raid the Transportation Trust Fund. In fact, $1 billion in local transportation revenues were hijacked by state lawmakers to balance the state budget and were never repaid. As a result, local road repair and maintenance suffered. Brown defended the gas tax by saying that drivers are now paying less for gas, very misleading because lower gas prices are largely the result of fracking which O’Malley/Brown has delayed since 2011. Then Brown defended MD’s fracking moratorium by saying that “there are no fracking permits pending in Maryland” without explaining that the permits lapsed because the oil/gas industry gave up on Maryland. Brown keeps trying to paint Maryland’s Obamacare website fiasco as a heroic victory for his resolve and perseverance (“We rolled up our sleeves and got it done”) resulting in a victorious “400,000 new health care enrollees.” But 330,000 were Medicaid enrollees who were automatically added because of new income eligibility. Only 70,000 joined Obamacare, half Maryland’s 150,000 goal, and the site never did work correctly. Then, Brown suggested that Hogan was corrupt because he was subpoenaed and investigated by a legislative committee. Sure, that was the Democrats’ smear probe into Ehrlich’s playing politics with state hiring, a Democratic tradition when they’re in power. The probe amounted to nothing except a political hit job, meanwhile those same legislative Democrats conveniently delayed a probe into Brown’s role in the Obamacare web fiasco until after this election. I guess their outrage has partisan limits. Thankfully, the debates are over. But, with only two weeks to go, the distortions, character assassination and fear mongering is just beginning. Blair Lee is a columnist for the Gazette and chairman of the Lee Development Group of Silver Spring. At close of the debate, Anthony Brown and Larry Hogan stand on the MPT set with moderator Jason Newton and the panel of reporters. First, it should be pointed out that contrary to past years’ debates, the three major gubernatorial debates were run nearly as perfectly as is humanly possible. Except for The Washington Post’s Jenna Johnson, whose deplorable one-sidedness in favor of Lt. Gov. Brown in debate No. 2 was off the charts, the moderators in all three debates were utterly disinterested and important-issue-focused. The third debate was another splendidly-run debate by Jason Newton, Deborah Weiner, Steve Hammond and Jeff Bowers. It was lively, punctiliously fair, and allowed both candidates to declaim on the crucial issues. I thought going into this final debate that Larry Hogan had to focus specifically on the issues that he thought warranted Marylanders’ votes. At which point he, Hogan, should state exactly what changes he would fight for and explain why they would relieve these seminal problems. That is almost precisely what he did. In doing so, I said this debate could represent the type of closure to a campaign that might lead to the type of victory that Ronald Reagan enjoyed in 1980 when, like in Maryland in 2014, people didn’t know the Republican nominee, were a little wary of how tough he could be, but were willing to take a chance to reverse the course of the misery index (unemployment plus inflation) and huge foreign policy failure as well. Hogan also said accurately that there were ongoing investigations of the healthcare situation and should have added that it is significant that the Maryland legislature won’t investigate it until after the election. Repeatedly, Hogan made clear the issues that he thought argued for his election, and, repeatedly, his eloquent but obfuscating opponent, Lt. Gov. Brown, argued irrelevant theses and ignored charges. Brown emphasized pre-K with no evidence that it improves academic performance or that Maryland can afford it. Hogan emphasized the loss of $288 million due to the healthcare run-up, and Brown said that lots of people were to blame, including himself, but not himself significantly. Brown could name no significant differences between him and Gov. Martin O’Malley, but said that some type of executive privilege rendered him unable to discuss much of it. He never answered charges concerning the consequential siphoning of money from the transportation fund. Brown again argued that since Hogan appointed the Board of Regents that he was somehow responsible for tuition hikes. Does he really believe that? Often when Brown gave an answer completely off-topic, the questioners gently asked him the question again – exactly. Perfectly fair and appropriate. If the people of Maryland elect Lt. Gov. Brown and reject Mr. Hogan, it will not be attributable to the latter’s debate inadequacies. Nor will it be due to the false and irrelevant answers to questions provided by Brown, however eloquently. It will be due to Democratic fealty, insufficiently affected by reasonable discourse. As both a citizen since 1946 and Free State voter since 1967, I found the third and final gubernatorial debate the most educational of the series. More issues were discussed for the first time: the state’s farming and poultry industries, watermen’s concerns, the Transportation Trust Fund and money for upgrading Maryland’s crumbling roadway infrastructure, the General Fund, the upswing of heroin and its gang related tie-in, and overall spending among them. Cosmetically, Mr. Hogan got a haircut, and for most of the telecast was correctly addressed by his last name by his opponent rather than the more casual “Larry.” In the end, however, Lt. Gov. Brown fell back on his opponent’s first name again, and twice employed the late Ronald Reagan’s 1980 ploy vs. President Jimmy Carter with his updated version: “There you are again.” I enjoyed it as political theater nonetheless. Regarding the Chesapeake Bay, perhaps one post-election question that should be asked and then addressed by whoever wins is: “How did the Bay get polluted?” In terms of the State’s natural gas reserves, one word that was never mentioned was fracking, and this will be a key issue for the next governor and legislature, either working together or apart. I take issue with all candidates for every office when they claim that government “creates jobs.” Maybe it does via the creation of more government jobs, but not elsewhere. To Brown’s claim that there have been 15,000 jobs created during the past eight years, I’d like to know exactly what and where they are. We weren’t told. In summation, I found all three debates well done, educational, and a boon to a electorate of “struggling Maryland families” trying to make up its mind for Election Day. Blaine Taylor is the author of 15 books of history, the latest biography being KAISER BILL! A New Look at Germany’s Last Emperor Wilhelm II, 1859-1941, published in 2014. If you’ve read my thoughts on the first and second debates, you would know that I thought Larry Hogan was the clear winner in both of them. I know that I’m biased, but Saturday night’s debate victory was a step above even the first two debates for Hogan. On every issue, on every question, it was very clear that both candidates understood where they were in the election process. Larry Hogan is clearly the candidate who understands that this is a competitive race, and a race that is breaking in his way. Anthony Brown, on the other hand, is a candidate who clearly sees that the coronation he expected not only isn’t coming easy, but is also slipping out of his grasp. While I noted that the second debate was chippy, this debate was openly hostile. However, it was one fought on issues that were favorable to Larry Hogan instead of Anthony Brown. The Brown campaign has tried to fight this campaign on issues related to abortion, contraception, and guns. And while the issue of gun control did come up during the debate, the exchange between the two candidates did Brown no favors. The debate format and moderators, to me, were the most professional and well-prepared of this entire debate season. The questions were balanced and fair, and the candidates were pressed to answer them even when they really tried to avoid doing so. It’s unfortunate both that this was the last debate, but also the fact that this debate aired at 7 p.m. on a Saturday night when voters weren’t very likely to see it. The last two weeks of this campaign may wind up being the ugliest, most brutal two weeks we’ve ever seen in Maryland politics. The Brown campaign is playing defense in places they expected to have locked up and the Democratic establishment will do anything to try to maintain their grip on power. It will be quite a scene. Brian Griffiths is a founder of Red Maryland, a partisan political blog. I’m not sure if this will come down to a racially or politically motivated divide, but hopefully Marylanders can see past it all and focus on the issues we face and the change that is needed going forward. Brown’s focus is on driving crime down, helping middle class values and working families and universal pre-kindergarten. Republican candidate Hogan’s focus is to bring change to a state that seems to be in desperate need of such. As a businessman and lifelong Marylander, he’s coming as a voice of the people who are frustrated with politicians and politics as usual. I enjoyed the format and believe it helped to keep things moving in a productive manner. The questions ranged from: the education gap, the poultry industry, natural gas drilling, health care, business climate and infrastructure. They gave their answers regarding their intentions once in office, but more interesting to me were the rebuttals. Whether it was Lt. Gov. Brown referring to Candidate Hogan’s desire to give tax breaks to the upper class or not supporting universal pre-K or his role with the previous Ehrlich administration. Or Hogan’s reference to the failed Maryland Heath Care roll out and subsequent investigation, or the decline in business and the 200,000 jobs lost or the rise in the gas tax. Whichever candidate is chosen on November 4th, I hope Marylanders go into the polls with an open mind and base their choice on all the facts and not emotion. If nothing changes, nothing changes. Melissa Bolling, an Army veteran, runs a Laurel home improvement business. Larry Hogan Jr. at the debate. On fertilizer runoff into the bay: Brown said he would work with farmers “….provided we don’t run them out of Maryland.” Say what? Our No. 1 strategic goal will be making Maryland the “…most competitive business climate.” This isn’t a meaningful goal because it isn’t objectively verifiable. It’s more like a marketing gimmick similar to the worst uses of StateStat. Brown got so twisted in his argument that he inadvertently dug himself into the position that the lieutenant governor is the policy equivalent to an appointments secretary. Mr. Brown, when you’re in a hole, stop digging. His $1.75 billion savings plan “…. builds on [budget cuts] we’ve already made.” In one sentence he completely discredits his savings plan. “Health care procurements went to the Board of Public Works.” No, they didn’t. Even if they did it would have been at least a year too late for anybody to counter the over-ambitions and unrealistic functionality that O’Malley-Brown engineered into the exchange platform. He took too much credit for “our AAA bond rating…” which is due as much to geography as anything O’Malley-Brown actually did. Mr. Brown, keep it real; take credit for borrowing as much as the debt sustainability committee allowed during many years of Fed-induced easy money. The achievement gap hasn’t been narrowed by O’Malley/Brown’s doubling education funding to $6 billion/year. Throwing money at the problem isn’t working. StateStat didn’t counter the $288 million wasted by the health exchange. No tax credits to cronies? You gave them $544 million. There’s been endless delay on studies about fracking. Hogan will make decisions and leverage the state’s natural resources. Every word of Brown’s campaign ads is untrue. They are the most disgraceful television ads that have ever been run. Voters are really tired of a monopoly where Democrats can pretty much just do anything they want with no checks and balances. You say I’m rooting for failure. You know, if I were rooting for failure I would just let you be governor. Are cost estimates for Brown’s light-rail transportation projects objective and reliable? Are the post-construction break-even analyses accurate? Are the deadlines realistic? Anybody who considers the idea of building light rail through densely populated D.C. suburbs and Baltimore has got to be skeptical of litigation costs and delays inherent to Brown’s high-priority projects. O’Malley-Brown says adopting the Federal exchange website was too expensive because it’s “incompatible” with the state’s existing Medicaid systems. Hogan needs to ask why this is so. By researching the question, he might learn that the state is facing monumental difficulty (with both cost overruns and deadline slippage) on another massive IT project called Medicaid Enterprise Restructuring Project (MERP), and its contractor, Computer Sciences Corporation. The MERP system would (assuming it is ever finished) replace the state’s backbone Medicaid payments system, but faces massive problems and a huge risk to taxpayers. Hogan needs to argue that the state’s fiduciary duty to taxpayers is about to take another hit, because the state may be in the process of wasting another $100 million. Charlie Hayward is a retired auditor of federal agencies who writes regularly for MarylandReporter.com. It was a more intimate setting Monday for the second TV debate between Republican Larry Hogan Jr. and Anthony Brown in their race for governor. Sitting side by side at a table in the studios of WJLA-News Channel 8 in Arlington the candidates went at it, questioned for an hour by three reporters. This story has links to all three video segments. Here are the reviews and observations from seven commentators: Melissa Deckman, Blair Lee, Barry Rascovar, Brian Griffiths, Rick Vatz, Blaine Taylor and Len Lazarick. More comments are welcome, especially from opposing points of view.